Hot, starting the morning at 77*. I thought I’d stepped out into a sauna. Now the sun has burned off the mist that was on the pasture, and golden beams paint the top of the old pecan tree. I’m getting ridiculously fond of that old tree. So I was sitting here on the porch, in the wicker chair with my legs curled up crossed as is my habit, and a pillow on my lap, writing in my journal. I felt this wiggle under my thigh. Mind on other things, I thought it was my muscle jumping. Comes again. What is that? Ran my hand and didn’t feel anything. Adjusted, fine. A moment later, it happened again. Ran my hand, nothing. Back to writing. Happened again, and a thought popped into my mind: “Was it…” I jumped up, saw nothing. A little apprehensive, I lifted the towel I keep laid over the cushion, and there was a lizard! 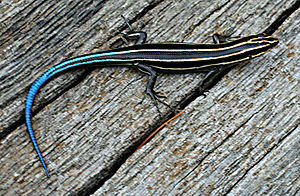 A blue-tailed skink, to be exact. They are everywhere this year. Thank goodness it wasn’t a snake. The little guy first froze. I shook the towel, and he scampered away. Think on that the next time you face a blank piece of paper. I had a similar experience. Mine was more dramatic, at least in the telling. I drew on my yellow goatskin gardening gloves. My thumb uncontrollably drew down. I forced it up with my other hand, it drew down again. I thought I was having a stroke. I pulled off the glove and a little lizard fell out. Oh, Nell Jean, that is a priceless story! And I’m so very glad you were not having a stroke. Thanks for sharing it and giving me a good laugh this morning.